In this 212th episode, Mike chats with Jesse Dylan and Gene Valaitis about their years on Toronto radio as Jesse and Gene, what they've been up to since and what's next for the duo. This episode is exactly 1:09:38. Toronto Morning Radio Personalities: Who is your Favourite? I have a Skype call scheduled this afternoon with Jesse and Gene. Jesse is in Vancouver and Gene is in California, so Skype will have to do for this reunion episode of Toronto Mike'd. Thinking of Jesse and Gene got me thinking of Toronto radio personalities over the past few decades. 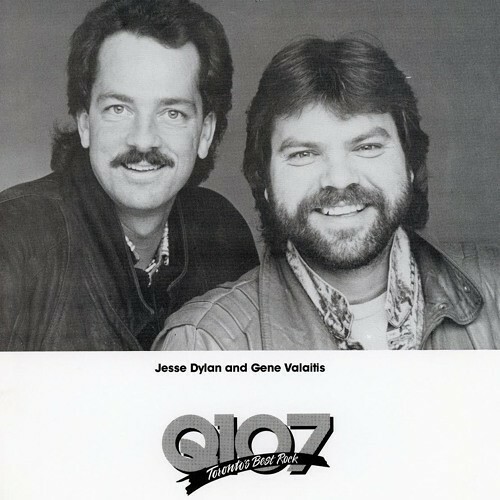 Jesse and Gene hosted the morning shows at Q107 (twice! ), 680 CFTR and AM 640. Here are other Toronto morning radio personalities who have paid me a visit since I started podcasting 4.5 years ago. Click their names to hear their episode! Roger's been a fixture on Toronto morning radio since the mid-80s when Roger, Rick & Marilyn formed. Roger and Marilyn are still on 104.5 CHUM-FM today. Rick Hodge is the Rick in the aforementioned Roger, Rick & Marilyn trio. He's now on morning radio in Niagara on EZ Rock 105.7. Erin's been a fixture on Toronto morning radio, most notably at CHFI where she teamed up with Don Daynard, Mike Cooper and Darren B. Lamb. She recently retired and now calls British Columbia home. Jay was a longtime morning show host in Toronto, most notably with Billie Holiday on the Maddog and Billie Show. He's now working afternoons at Newstalk 1010. Speaking of Billie Holiday, she most recently worked mornings at Todd Shapiro's replacement on The Dean Blundell Show on 102.1. She can now be heard on 93-5 The Move. Speaking of Todd Shapiro, he was a fixture on 102.1 the Edge for over a decade as Dean Blundell's sidekick. The other member of the longtime three-man booth at 102.1 the Edge was Jason Barrr who is now working mornings with Chris Biggs on 97.7 HTZ-FM. Even if you don't listen to Kiss 92.5 you've likely seen the ads for the Roz and Mocha morning show. When Roz isn't on the radio he's moonlighting as co-host of ET Canada. The other (some say better) half of the Roz and Mocha show on Kiss 92.5 is Mocha Frapp. And no, that's not his real name. The ever-popular Metro Morning show on CBC Radio One is anchored by Matt Galloway who has successfully filled the giant shoes of Andy Barrie. Stu used to be teamed with Colleen Rusholme but now runs the boom 97.3 morning show on his own. Stu's former partner Colleen has also hosted mornings with Humble Howard and now co-hosts mornings with Darrin Laidman on 95.3 Fresh Radio. Howard has had morning show stints in this city with Colleen Rusholme and solo, but he's best known as half of Humble and Fred who spent over a decade at 102.1 the Edge. Fred is the other half of Humble and Fred, but did sports on the Pete and Geets show prior to that. Steve's popped up here and there on Toronto morning radio, including time at CFNY co-hosting with the aforementioned Freddie P.
Speaking of guys who briefly co-hosted mornings with Freddie P on CFNY, Scot, or Skot as he was then known, did so when Humble left for Mix 99.9 in the very early 90s. Scot is now Program Director at 93-5 The Move. 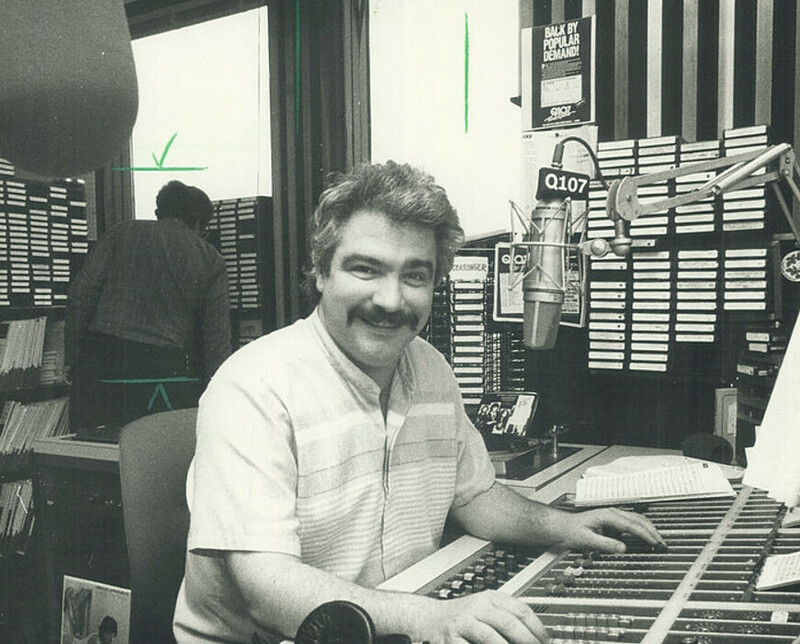 Mike has been at 640 for many years now, but he was doing news for the Pete and Geets show in the 80s. Mike had a couple of morning radio stints at 1050, once when they were briefly The Team, and most recently when they re-branded as TSN Radio. Josie is about to resurface on Toronto morning radio, but she once hosted 102.1 the Edge mornings with Dominik Diamond. Landy and Stellick held down the morning shift at The Fan 590 for years. After Don Landy and Gord Stellick were removed as morning show hosts at The Fan 590, Jeff Lumby filled in for a summer before the Andrew Krystal experiment. Speaking of The Fan 590 morning shows, Greg Brady co-hosted post-Krystal with Jim Lang until Lang was replaced by Andrew Walker. Andrew co-hosted mornings on The Fan 590 with Greg Brady until they were moved to afternoons to make way for Dean Blundell. John was a member of the Q Morning Zoo in the 90s and most recently The Happy Gang on Zoomer Radio AM740. Raina was working mornings at indie 88 but now anchors the CBC Radio Two morning show now that Tom Power is hosting q. Who is your favourite Toronto morning radio show host of all-time? Let me know in the comments! George Stroumboulopoulos invited some of Canada's best musicians to his home and had them cover Tragically Hip songs. The result was four awesome hours of what he calls Hip 30. All four hours of Hip 30 audio is available to you here. Enjoy this most excellent playlist. Jeff "Scruff Connors" Newfield was 64. He was the radio broadcaster best known in these parts for his two stints at Q107, and most recently, MOJO Radio. Josie Dye started at 102.1 the Edge way back in 2002. She took over middays when Kelly Cutrara left and stayed in that spot until she moved to mornings following the cancellation of the Dean Blundell Show. That experiment didn't last long, and Josie Dye was moved to 2pm-6pm. 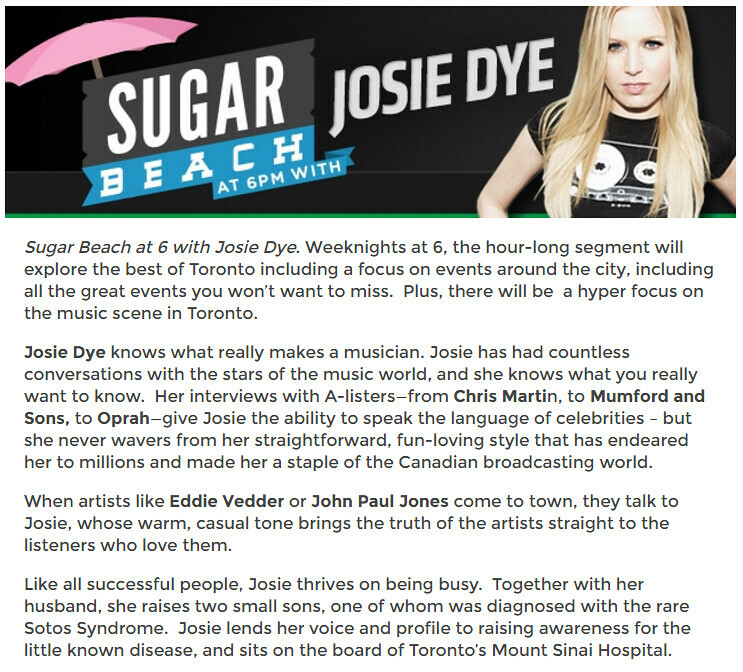 Following her maternity leave, she hosted Sugar Beach at 6pm. Today, she announced she's leaving 102.1 the Edge. Just prior to her aforementioned maternity leave, Josie visited my home and sat down for a great conversation about her career. You can hear her on episode 132 here. When I was young, I'd slowly turn the dial on my transistor radio to see if I could pick up stations from outside the GTA. I'd get awfully excited when I'd find a station in Cleveland, for example. I distinctly remember doing this one Christmas Eve and being delighted by the cute Christmas skit I heard on an American station. This website is absolutely blowing my mind. Radio Garden literally lets you cruse the planet, tuning in different stations as you travel. Earlier today I was listening to radio stations in The Philippines where they were playing Bryan Adams. If you have any interest in radio at all, you're going to fall in love with Radio Garden. I know I have. Last week I was chatting with Chris Zelkovich about Toronto's sports radio stations. I asked him to imagine what might happen if Bob McCown left 590 for the same timeslot on 1050. In this scenario, do you think Bob McCown would be permitted to say goodbye to his 590 audience during his last appearance on Prime Time Sports? I've noticed a trend lately where radio stations are allowing their talent to say goodbye, even when they've quit for a job at a competitor station. This just happened Friday when Corus-owned Q107 allowed Maureen Holloway to say goodbye to her listeners, even though Maureen has left Q to replace Erin Davis on Rogers-owned CHFI. It's not just Corus extending such a courtesy. Central Ontario Broadcasting's Indie88 let morning show host Raina Douris say goodbye as she left to host mornings on CBC Radio 2. That was very decent of them. And Bell let Darren B. Lamb say goodbye on CHUM-FM when he left to replace Mike Cooper on CHFI. Sure, there was a long pause between those two gigs, but it was still a kind gesture. In all of these instances, the radio personality resigned. When the personality is fired, there are still no goodbyes. Jason Barr didn't get to say goodbye, Todd Shapiro didn't get to say goodbye, Jeff Woods didn't get to say goodbye and Maddog didn't get to say goodbye. I suspect the station doesn't want to deal with the inevitable blowback when one's favourite radio host is canned. The exception here is when they let someone go and spin it as a retirement. Christine Bentley suffered such a fate at Bell-owned CTV. I've had radio veterans tell me the worst part of getting fired is being unable to say goodbye. Imagine a future where this isn't the case and every employee is treated with kindness and decency. I like to think we're getting there. Erin Davis, a fixture on Toronto radio for 28 years, has announced her retirement. She records her last morning show for CHFI on December 15 and will then move with her husband to British Columbia to "begin a new life". I had the pleasure of being visited by Erin for episode 84 of my podcast and it remains a personal favourite. She shared the goods about getting fired and rehired by CHFI, her classic Blue Jays songs, sleeping with the boss (scandalous!) and lessons learned along the way. If you've never heard it, I urge you to correct that oversight by clicking play below. Earlier this year, Mike Cooper retired from mornings on CHFI. Mike was replaced by Darren B. Lamb who came over from CHUM-FM. There's no word as to who will replace Erin on CHFI after December 15. Erin, if you're reading this, I wish you peace, love and happiness in BC. You deserve it. And since I forgot to take my customary post-podcast picture with you, I'm hoping we can correct that oversight before you depart in December. I'm closing this entry with a great old ad with WKRP's Herb Tarlek and CHFI's Don Daynard and Erin Davis. Classic! 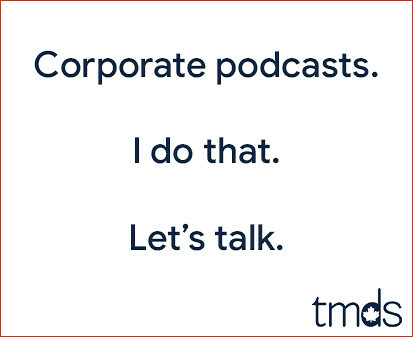 In this 200th episode, Mike chats with broadcasters Humble Howard Glassman and Fred Patterson about their podcast, the state of radio today and how long they'll run. This episode is exactly 1:50:37. Way back in 2003, Humble and Fred were the morning show on AM 640, only then it was called Mojo Radio. 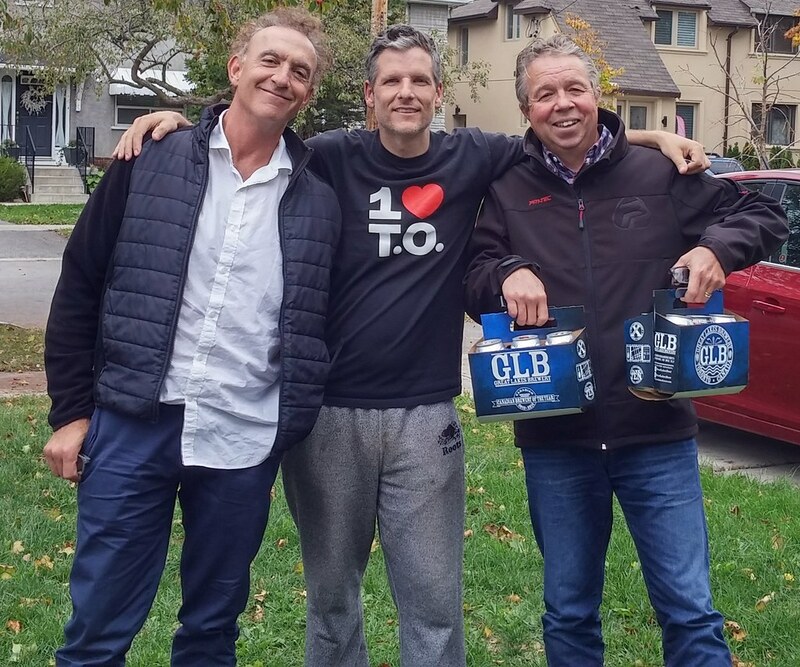 Humble and Fred were seduced by Mix 99.9 and gave notice, so AM 640 recruited John Oakley form rival CFRB and Oakley worked mornings on 640 ever since. Until now. John Oakley is switching to the afternoon drive and is now heard on 640 from 4pm - 7pm. Taking his place in the mornings is a new show featuring Matt Gurney and Supriya Dwivedi. Matt Gurney is from the National Post and Dwivedi has been featured on CBC and in the Toronto Sun. But what of my friend Kelly Cutrara who took over Bill Carroll's spot when Bill left for Ottawa in February? I'm pleased to report Kelly will now have her very own show 2pm - 4pm. Mike Stafford is now 9am to noon and Tasha Kheiriddin will be heard noon - 2pm. Got all that? Meanwhile, at Newstalk 1010, there are also a couple of changes. Mike Bullard's noon shift is no more. He's no longer on the station, having been charged with criminal harassment in connection with the alleged stalking of City TV journalist Cynthia Mulligan. David Eddie, who had a daily live late night show, has been replaced by syndicated programming out of Montreal. David can still be heard Sunday nights.